Natural, functional properties and modern designs - Merino jackets and wool jackets are incredibly comfortable to wear and fantastic companions for all occasions. From short jackets with hoods to warmer wool coats with fleece inserts - there is something for everyone! High-quality virgin wool - the best quality comes from merino sheep in New Zealand merino sheep - has a few crucial advantages over simple wool or cotton and is ideal for comfortable, everyday outdoor clothing. Its crimped structure is able to trap a lot of air and form a cushion that is warmed by body heat. Merino wool is sheared from living animals every year and is not made of recycled material. Each sheep can provide approximately five kilograms of wool at a time. Chris, the merino sheep, holds the record. He lost his herd, wandered aimlessly through New Zealand and after several years without shearing managed to provide a whopping 40 kilograms of wool! The fantastic, natural functional properties and high degree of comfort are the main reasons why merino is so popular. Men and women alike are guaranteed to find the right merino jacket at big manufacturers like Icebreaker, Woolpower, Bergans, Mufflon and Vaude. Merino jackets offer everything an outdoor athlete could need! Merino wool jackets are fantastic for climbing, trekking, hillwalking and everyday use. Merino jackets ensure the best thermal output, breathability and natural UV protection, but are a relatively low weight. Whether it's merino wool jackets by Icebreaker, from Smartwool or any other companies, anyone who has experienced the benefits of the "miracle fibre" merino wool will never want anything else! The raw materials used to make merino wool jackets, the merino wool, is harvested from merino sheep. These sheep live mainly in the Southern Alps. The climate there is harsh and cold and it gets very hot in the summer. The wool from merino sheep cools in the summer, warms in the winter and protects against aggressive radiation. These properties transfer one to one into merino wool jackets. The special properties in merino fibres makes merino jackets real all-round talents. First things first: Merino wool jackets keep you very warm. 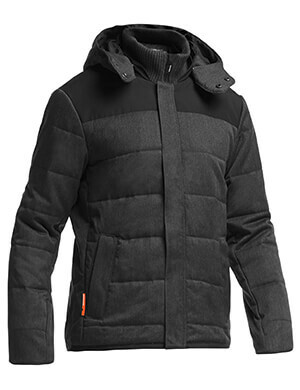 Worn on its own or as an additional insulating layer, it will impress with its enormous insulation power under an outdoor jacket. Although merino jackets are real heat retainers, they are relatively thin and feel great on the skin. The fine texture of merino wool creates a fine and skin-friendly fabric, which will steel feel just as great after longer periods of wearing it. Odour resistance is another important property of merino jackets. Foul sweaty odours don't stand a chance! 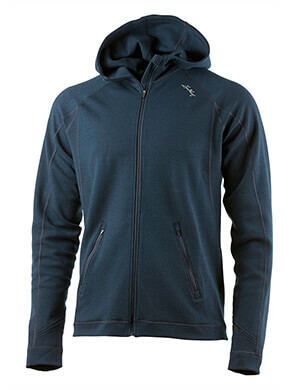 In addition to that, merino jackets are also easy to clean, machine washable and quick-drying. Anyone who spends a lot of time outdoors will know how important UV protection is. What more could you want? It depends on what you need it for. Are lively, sweat-inducing activities on the cards, or long, leisurely activities? Functional underwear, pullovers and jackets made of synthetics wick moisture directly away from the body. This is particularly important when doing more intense activities like jogging, trail running and aerobic activities in general. Sweat is directly absorbed and wicked outwards. This ensures the body does not cool down during calmer periods or when taking breaks. Synthetic fibers also dry quickly when they are soaked through. Without proper treatment, however, these tend to take on nasty odors from sweat-decomposing bacteria settling in the material. This is not the case with merino wool, as it does not retain odors and can be worn several times without any issues. It does dry slower, but for that it warms in the cold and cools in higher temperatures. For this reason, merino jackets are perfect for any activity that does not make you break too much of a sweat. This can include hiking, mountaineering, skiing and leisurely strolls. You will always be prepared for what nature throws your way with a functional wool jacket on your side!